On May 31st 2018, XENON1T released the result of a search for dark matter interacting with xenon atoms using an exposure of 1 tonne-year. Papers presenting the scientific results are written to be brief, and communicate the most important information to the scientific community. Therefore, many details of the instrument, reconstruction of events and analysis work by the entire collaboration must be left out of the science papers. 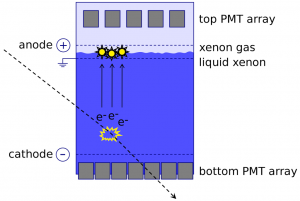 XENON1T has previously published a paper focusing on the operation of the detector itself. 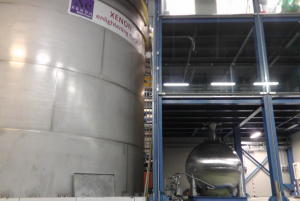 A new paper by XENON1T now goes into the details of the analysis of the XENON1T data, and another one, on the event reconstruction and calibration, is being prepared. XENON1T detects the scintillation light and ionization electrons that energy depositions in the two tonne liquid xenon target produce. In addition to WIMPs, different background sources can produce an S1+S2 signal. The expected S1,S2 distribution may change depending on whether the energy deposition happens by a recoil on an electron of the xenon atom or the nucleus. This is one of the main methods XENON uses to discriminate against backgrounds, since WIMPs, which scatter on the xenon nucleus, have a mean S2 lower than 99.7% of the dominant background component, which is made up of scatters on electrons. Modelling how an electronic or nuclear recoil will look like in the detector is crucial both to know the shape of a WIMP signal, and to model the backgrounds well. XENON1T uses a comprehensive fit to multiple calibration sources to constrain the distributions of backgrounds and signals in the analysis space; S1, S2 and the radius from the center axis of the detector. Some background components are harder to model directly, and are estimated by using sidebands or other data samples. In the XENON1T analysis, coincidences between unrelated, lone S1 and S2 events were modeled this way, in addition to the surface background– events occurring close to or at the detector wall. 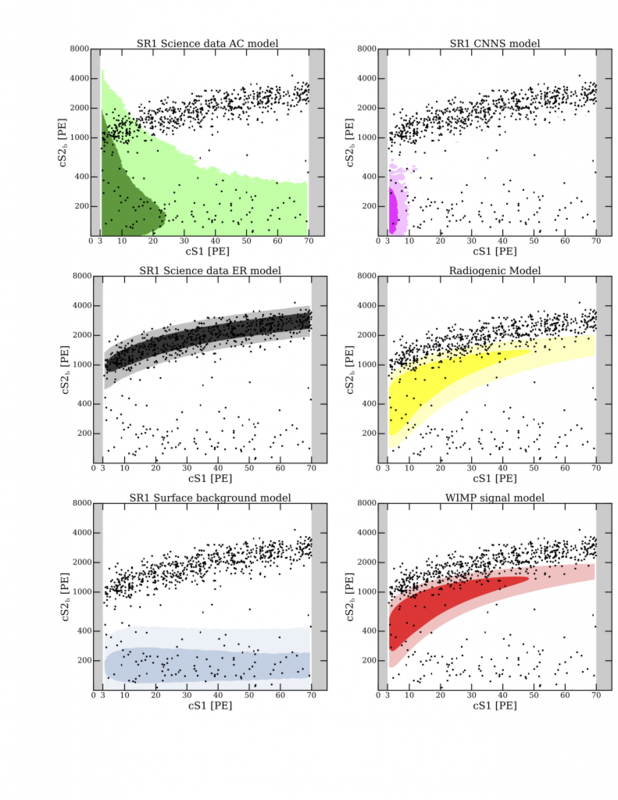 Models of various backgrounds and the expected WIMP signal in two of the parameters extracted from each even, scintillation S1 and ionization S2 signals. 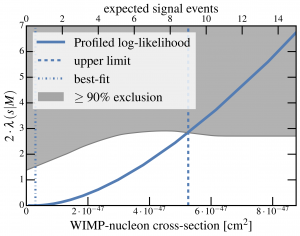 The models of each background and the signal, for two separate science runs, are put together in a likelihood, which is a mathematical function of the WIMP signal strength as well as nuisance parameters. These are unknowns that could change the analysis, such as the true expectation value for each background component. 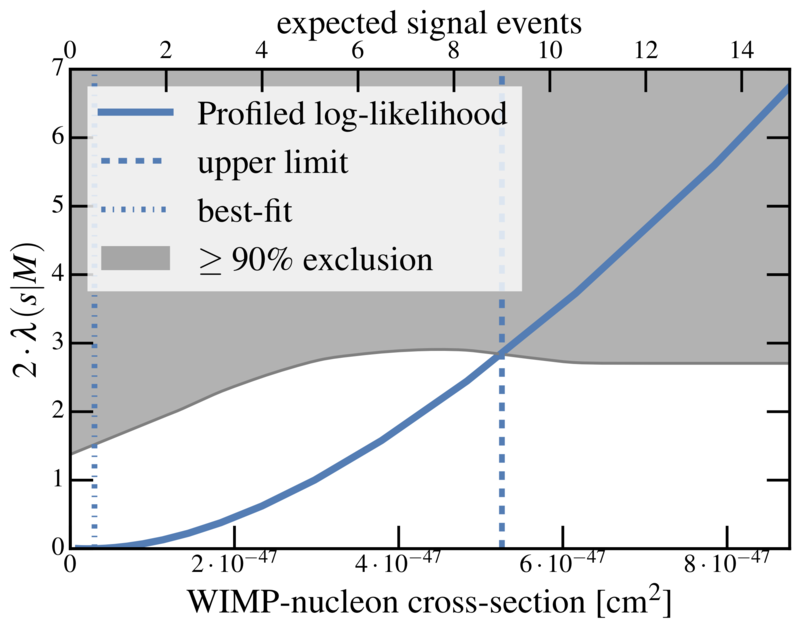 The likelihood also contains multiple terms representing measurements of nuisance parameter, which constrain them when the likelihood is fitted to the data collected by XENON1T. The gray area shows likelihoods that corresponds to a 90% exclusion. The confidence interval– the region of signal strength compatible with the observed data– is the region where the likelihood lies below the gray band. The models and tools used in the XENON1T spin-independent analysis are also used to explore alternative models of dark matter, such as spin-independent interactions and scatterings between WIMPs and pions, with more to come! This entry was posted in Publications and tagged 2019, analysis, experiment, inference, modelling, publications, results, statistics, XENON1T on March 4, 2019 by Knut Morå. Once a year the Spring-Meeting of the German Physics Society (DPG “Deutsche Physikalische Gesellschafft”) takes place. This year I had the opportunity to talk about the planned neutron Veto for XENONnT in Würzburg (19.-23.3.2018). In order to maximize the fiducial volume, we want to veto nuclear recoils. Therefore we are working on a neutron veto system based on Gadolinium loaded liquid scintillator. The plan is to use acrylic boxes, which can be filled with liquid scintillator before being placed around the TPC cryostat. 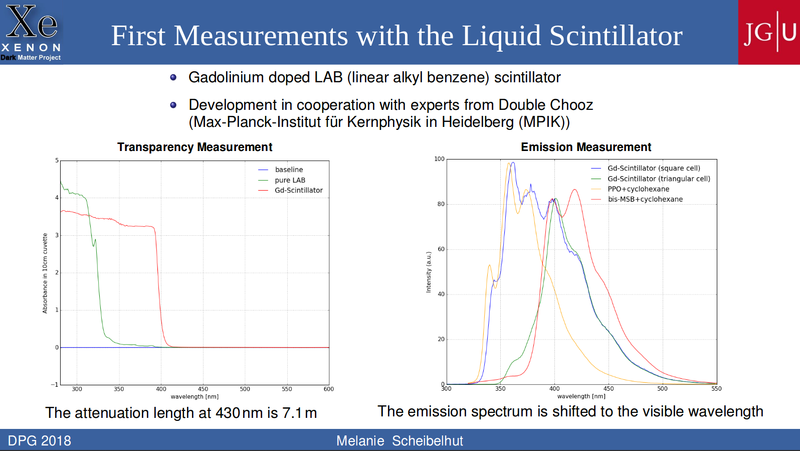 Building on the experience of DOUBLE CHOOZ, we developed a first LAB-based liquid scintillator doped with 0.1 % Gadolinium and two wavelength shifters. 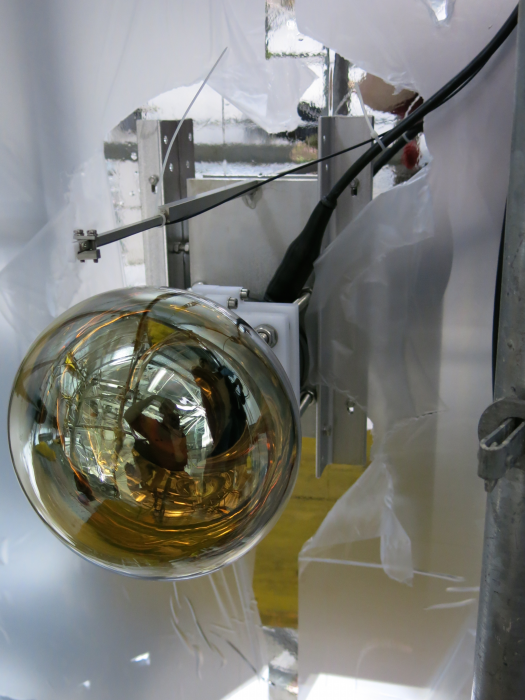 Three measurements were performed to test the optical properties, transmission, emission and relative light yield. 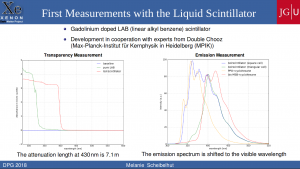 From the transmission measurement, we learned that the attenuation length of the scintillator at a wavelength of 430nm is 7.1m. The emission measurement shows the shifting due to the wavelength shifters to the visible wavelength. And with the relative light yield measurement we can compare an unloaded scintillator sample with the Gd-loaded sample. The light yield for the loaded scintillator decreases to 74% of the unloaded sample. Our next steps will be to find a supplier who can provide us with a large and pure amount of the Gadolinium-Complex and to build a setup for neutron tagging measurements. This entry was posted in Talks and tagged 2018, experiment, neutron veto, talk, XENONnT on April 25, 2018 by Melanie Scheibelhut. 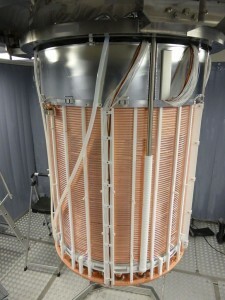 XENON1T is currently the largest liquid xenon detector in the search for dark matter. To fully exploit the capabilities of the ton-scale target mass, a thorough understanding of radioactive background sources is required. In this paper we use the full data of the main science runs of the XENON100 experiment that were taken over a period of about 4 years to asses the target-intrinsic background sources radon (Rn-222), thoron (Rn-220) and krypton (Kr-85). We derive distributions of the individual radionuclides inside the detector (see Figure below) and quantify their abundances during the main three science runs. We find good agreement with external measurements of radon emanation and krypton concentrations, and report an observed reduction in concentrations of radon daughters that we attribute to the plating-out of charged ions on the negatively biased cathode. The preprint of the full study is available on arXiv:1708.03617. Figure: Spatial distributions of the various radon populations identified in XENON100. This entry was posted in Publications and tagged 2017, analysis, background, experiment, publications, XENON100 on September 5, 2017 by Sebastian Lindemann. In October 2015 the assembly of the XENON1T time projection chamber (TPC) began in the above-ground cleanroom at LNGS. After methodical cleaning to remove impurities and etch away radioactive surface contamination, all of the necessary components to build the new instrument were ready. A small team of scientists with the help of a few technicians steadily constructed the first of the next generation of TPCs for dark matter direct detection. Insertion of fiber optic cables through the PTFE panels of the field cage. First the field cage was assembled by mounting the teflon (PTFE) support pillars between top and bottom rings and inserting the 74 copper field-shaping rings (see the October 5 post for details). The approximately 1 meter high by 1 meter diameter structure was assembled on a special table to allow access from the top and inside of the cage to install reflector panels and resistor chains and to insert fiber optic cables. Weaving of one of the 24 fiber optic cables around the top ring of the TPC and through a 250 μm hole in the PTFE panel is shown in the image to the right. The fibers will be used to uniformly distribute light inside the TPC for PMT calibration. One can also see in the image two sets of high voltage chains (diagonal strips inside the copper rings) that run vertically along the field cage. A chain consists of 73 resistors (5 GΩ each) that bridge neighbouring rings, allowing for an optimal electric field of 1 kV/cm. In parallel to the field cage construction, the top PMT array (see the October 29 post for more details) was installed inside the TPC diving bell. Field cage from above after installation of gate and anode electrodes. 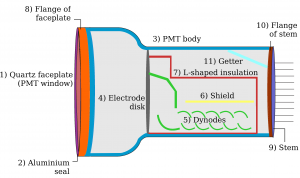 Next the cathode, anode and gate electrodes that provide radially-uniform electric fields across the TPC and the screening meshes that protect the PMTs from the high electric field were installed. The electrodes consist of wires or hexagonal meshes (grids) stretched across stainless steel rings. 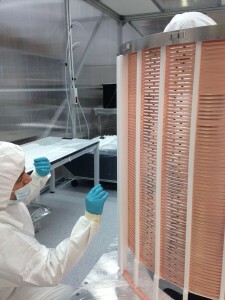 The bottom screening mesh, cathode, and small PTFE reflectors were assembled onto the bottom PMT array while still in its transport box. To assemble the “top stack”, shown in the image to the right, the gate grid was gently lifted and affixed onto the top TPC ring, followed by the anode grid, with 5 mm insulating spacers in between the two grids. The xenon liquid/gas interface will reside between these two electrodes. Then the small PTFE reflector panels were assembled and the protective mesh for the PMTs was placed on top. Levelmeters that measure by capacitance the height of the liquid xenon were installed onto the top TPC ring. At this point the field cage was ready to be mounted inside the bell. 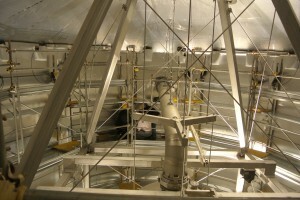 Top PMT array and reflector panels as seen from below the field cage. 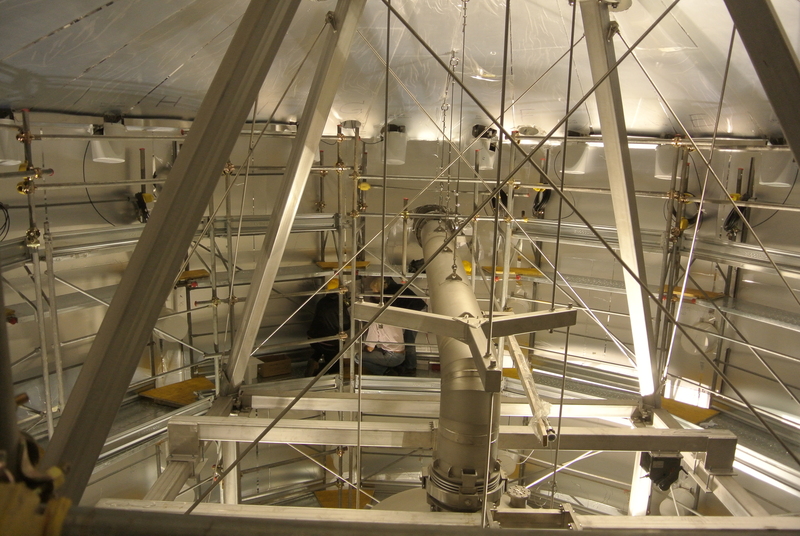 The striking image to the left shows the top PMT array as seen from the bottom of the field cage after mounting it to the bell. One can even see the ghost-like images of PMTs reflected in the polished surfaces of the PTFE panels! The graininess of the array in the photo comes from the three mesh layers of the top stack. In the days that followed, the bottom PMT array, with cathode, was mounted to the field cage, and monitoring devices such as temperature sensors and diagnostic PMTs were installed. Finally, the TPC was wrapped and secured to prepare for its big move underground. TPC (high-voltage feedthrough side) mounted to the top dome inside the water tank. On November 4th the TPC was transported into Hall B and wheeled inside the water tank for installation. Using a set of 3 winches from the top dome of the water tank, the delicate instrument, now close to 500 kg, was slowly and carefully raised from the bottom of the tank, through an opening in the cleanroom floor, and up to the dome of the tank. At this point integration of the TPC with other XENON1T subsystems, such as the DAQ and cryogenics systems, began. 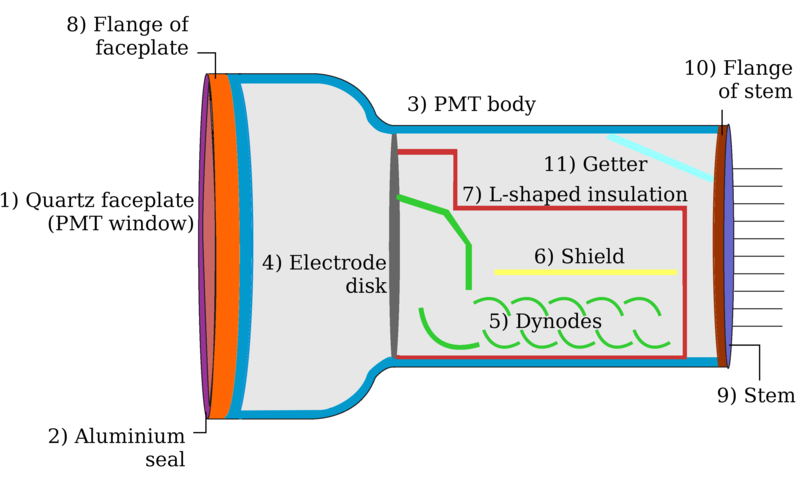 The high voltage feedthrough, piping for liquid xenon, and cabling for PMTs, fiber optics, sensors, and electrodes were connected. After many visual and mechanical checks, electrical tests, and a final cleaning, the stainless steel vessel that will contain the liquid xenon was lifted and sealed to enclose the TPC. The instrument is now ready for the next phase of XENON1T commissioning. This entry was posted in Experiment and tagged 2016, construction, experiment, TPC, XENON1T on January 19, 2016 by Michelle Galloway. E. Aprile et al (XENON Collaboration), Lowering the radioactivity of the XENON1T photosensors, arXiv:1503.07698, Eur. Phys. J. C75 (2015) 11, 546. 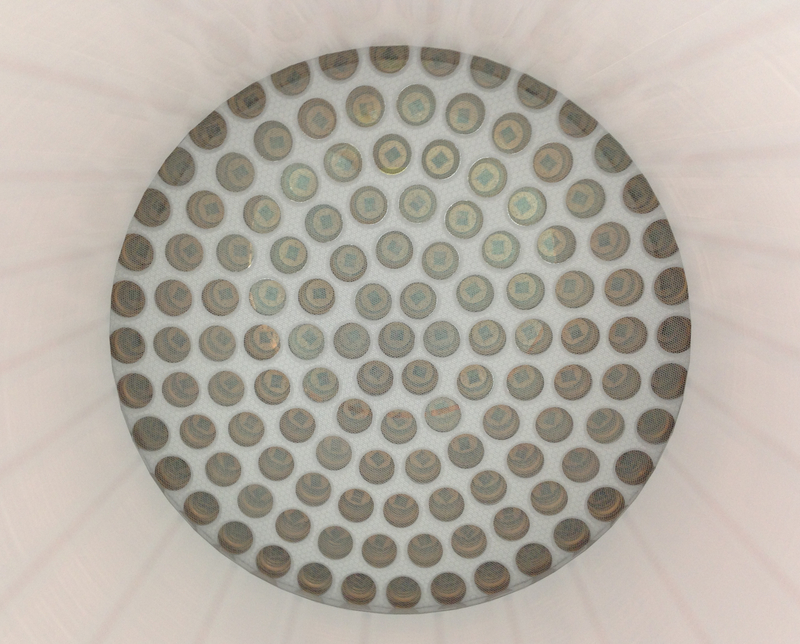 The XENON1T experiment employs 242 photomultiplier tubes (PMTs) in the time projection chamber, arranged into two circular arrays. Because the overall background goal of the detector is incredibly low, with less than 1 expected event in a tonne of liquid xenon and one full year of data, the PMTs must be made out of ultra-pure materials. These materials were selected for their content in traces of 238-U, 232-Th, 40-K, 60-Co, 137-Cs and other long-lived radionuclides. The XENON collaboration joined efforts with Hamamatsu to produce a photosensor that meets the strict requirements of our experiment. The sensor is a 3-inch diameter tube that operates stably at -100 C and at a pressure of 2 atmospheres. It has a high quantum efficiency, with a mean around 35%, for the xenon scintillation light at 178 nm and 90% photon collection efficiency. The sensor, shown schematically in the left picture, features a VUV-transparent quartz window, with a low-temperature bi-alkali photocathode deposited on it. A 12-dynode electron multiplication system ensures a signal amplification of ~3 millions, which is a crucial feature to detect the tiny signals induced by the rare collisions of dark matter particles with xenon nuclei. Before the tubes were ready to be manufactured, the construction materials were inspected with gamma-ray spectroscopy and glow-discharge mass spectroscopy (GDMS). For the former, we employed the world’s most sensitive high-purity germanium detectors, GeMPI and Gator, operated deep underground at the Gran Sasso Laboratory. GDMS can detect trace impurities in solid samples and the results were compatible with those from germanium screening. We measured many samples to select the final materials for the PMT production. As an example, specific 226-Ra activities around or below 0.3 mBq/PMT were seen in most of the inspected materials. Such an activity corresponds to 3 x 10-4 226-Ra decays per second and tube, or about 26 decays per day. The relative contribution of the selected materials to the trace contaminations in U, Th, K, Co and Cs of the final product, seen in the left picture, also tells us how to improve further sensor versions for the XENONnT upgrade. Most of the nuclides in the 238-U and 232-Th chains, especially dangerous for their emission of alpha particles, that can the produce fast neutrons in (alpha,n) reactions, are located in the ceramic stem of the tube. In consequence, finding a new material to replace the ceramic might drastically improve the background expectations. Once the final production started, and the tubes were delivered in several batches to our collaboration, they were measured in the Gator detector. Its inner chamber can accommodate 15 PMTs at a time, as seen in the left picture. Each batch was screened for about 15 days, and theobserved activities were mostly consistent from batch to batch. For all measured PMTs, we obtain contaminations in uranium and thorium below 1 mBq/PMT. While 60-Co was at the level of 0.8 mBq/PMT, 40-K dominates the gamma activity with about 13 mBq/PMT. 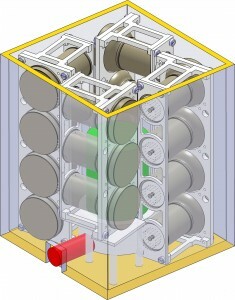 The information from screening was considered in the final arrangement of the PMTs in the XENON1T arrays. PMTs with somewhat higher activities are placed in the outer rings, where they are more distant from the central, fiducial xenon region of the detector. The average activities per PMT of all trace isotopes served as input contaminations to a full Monte Carlo simulation of the expected backgrounds in XENON1T. The results show that the PMTs will provide about 1% and 6% of the total electronic and recoil background of the experiment, respectively. We can therefore safely conclude that the overall radioactivity of the sensors is sufficiently low, and they will certainly not limit the dark matter sensitivity of the XENON1T experiment. This entry was posted in Experiment, Publications and tagged 2015, background, construction, experiment, photomultiplier, publications, XENON1T on December 18, 2015 by Laura Baudis. 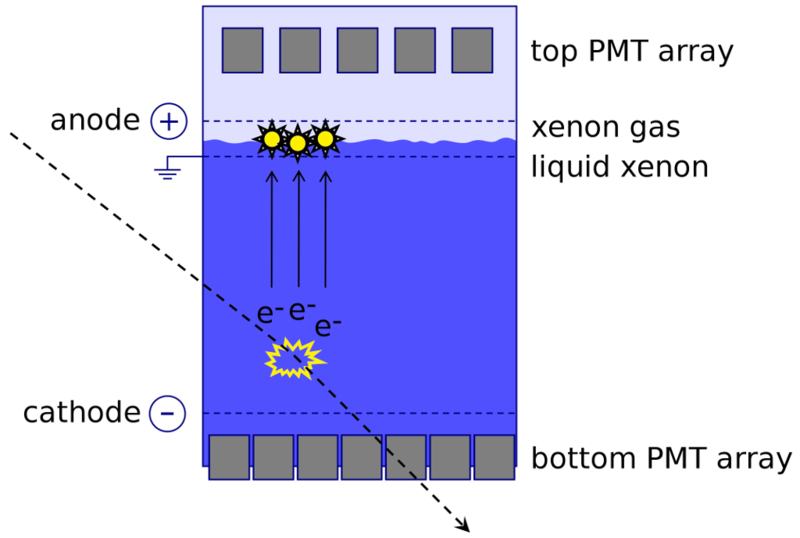 Knowing the exact level of the interface between the liquid and the gaseous phase in the XENON1T TPC is crucial for the operation of the detector, and very important to understand its response. Reason for this is the so-called S2 signal, which is the second signal one measures after an event happens in the detector. It originates from electrons, which are produced when a particle scatters off the xenon, and which rise up in the electric field of the TPC until they reach the liquid-gas interface. There, an even stronger electric field is extracting them from the liquid and accelerates them towards the top of the detector. The field is strong enough that, while drifting through the xenon gas, the electrons hit xenon atoms on their way, exciting each of them to emit an ultraviolet photon. A single electron will thus produce an amplified signal of up to 300 photons, of which about 20 will be ultimately detected. The proportional scintillation light produced by this electron avalanche is detected by the top PMT array of the detector. The size of the resulting signal is proportional to the number of electrons produced. The meshes which apply the electric fields in the detector are at fixed positions. Hence, a lower or higher level of the liquid-gas interface has direct influence on the drift length of the extracted electrons in the gas and thus a direct influence on the size of the S2 signal. The size of the S2 signal in turn is a very important parameter which is used in many different ways in the data analysis. So a very good understanding is required of where the liquid level is. To get that information, we have designed special instruments to measure the liquid level inside the TPC. Those levelmeters work capacitively, which means that they are basically hollow capacitors, which change their capacitance proportional to the level they are immersed in liquid xenon. In normal operation mode, the system is in a thermal equilibrium, so there are no changes in the liquid level. The TPC is designed in a way that one can manually adjust the liquid-gas interface to a higher or lower level. This dynamic range of the XENON1T TPC is about 5mm. Hence the levelmeters are of similar height. The capacitance of a capacitor increases with the area of its electrodes. To achieve the highest possible capacitance change from the lower end of the capacitor to its upper end, a detailed simulation has been performed at the University of Mainz in Germany for different shapes and sizes of capacitors. It turned out that a triple-plate capacitor of 61mm length and 10mm height is the best compromise of having a large capacitance change per unit height, while still being small enough to enable a point-like measurement of the level in the TPC. The three plates of the capacitor are 0.5mm thick and are separated 1mm from each other. To prevent the capacitors from the large electric fields surrounding them, they are shielded by a copper cage. In addition, since the levelmeters are very close to the detector, they are made out of high purity copper to prevent introducing additional radioactive backgrounds. The levelmeters change their capacitance by ~1pF per mm that is filled with liquid xenon. This translates to a resolution of an amazing ~3µm to measure the liquid xenon level! Four of those devices are distributed around the TPC. This gives us the possibility to level the detector in µm precision. The capacitor signals are read out via a pair of 15m long coax cables and an electronic circuit that is connected to the slow control system of XENON1T. 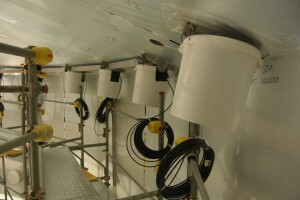 The short levelmeters for the XENON1T experiment. Three capacitor plates inside a copper cage provide a precise measurement of the liquid level inside. 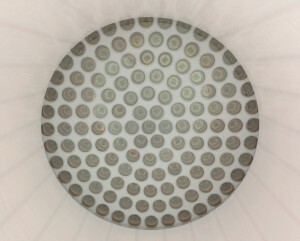 Another use case for levelmeters is the monitoring of the filling process of the cryostat. 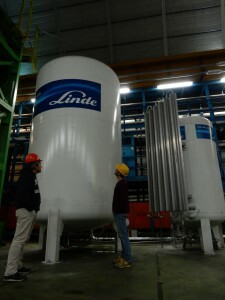 In order to do this, two 1.4m long double-walled stainless steel cylindrical capacitors are located at the outside of the TPC, covering its full height. As for the short levelmeters, the long ones also work in a way that their capacitance is changing according to how high the liquid xenon rose inside them. Here, the compromise between having a large capacitance change per height value versus very small space requirements had to be made. The diameter of the outer conductor was designed to be 6mm, for the inner conductor to be 3mm. This leads to a capacitance change of 0.10 pF/mm and enables a resolution of ~30µm for measuring the absolut level of liquid xenon in the TPC. The XENON1T levelmeters are well designed sensors by its own and have been developed over more than one year. 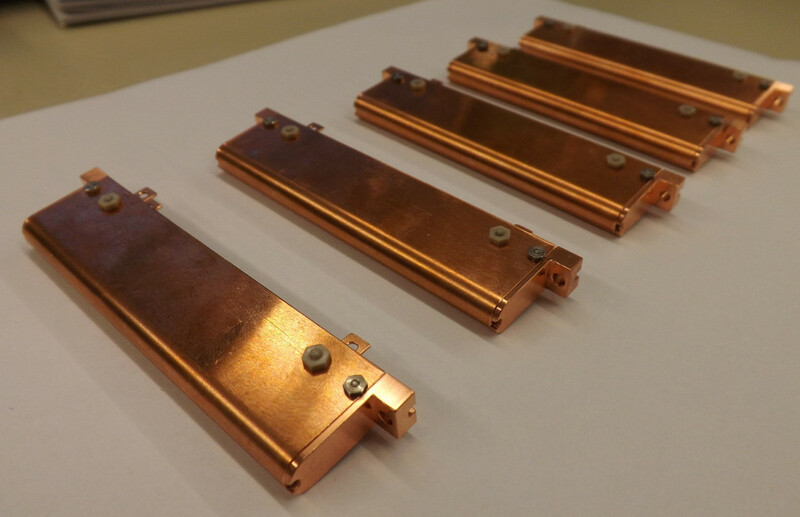 After production in June 2015, they are shipped to LNGS, where they will do their job over the next years during the run-time of the XENON1T detector. This entry was posted in Experiment and tagged 2015, construction, experiment, level meter, Mainz, S2 on June 13, 2015 by Christopher Geis. The cryostat of the XENON1T experiment is surrounded by an huge and fascinating detector: the Muon Veto. In order to understand what it is, let us remember why we are building an experiment underground. Over our heads, a lot of particles are constantly produced by primary cosmic rays. Secondary particles can provide contamination for low background experiments, such as XENON1T. For this reason, one has to build such experiments in a place where most of these particles cannot penetrate. Only high-energy particles, like muons, and weakly interacting particles, like dark matter, can cross many kilometres of rock. Even though muons can be distinguished from dark matter due to their electric charge, they can also produce neutrons, which mimic dark matter signals. It is therefore very important to properly identify muons and reject their associated signals. This is the main task of the Muon Veto system. The Muon Veto exploits the peculiarity of very fast muons to induce photons (sometimes thousands of them!) when crossing a layer of water. It is composed by a big cylindrical water tank, about 10m high and 9.6m diameter. Roughly 4m of water, surrounding the inner detector, provide an additional passive shield from the environmental radioactivity, reaching a factor 100 of background suppression. The water tank is equipped with 84 water proof Photo-Multiplier-Tubes (PMTs), which behave like super-sensitive single-pixel cameras. Before mounting the PMTs, we have subjected them to high pressure and water tests, in order to simulate the water tank conditions. Moreover, we have measured their most important properties and classified in different setups. The inner part of the water tank is covered by a reflective foil, which with 99% reflectivity looks like a perfect mirror. Its purpose is to keep the photons inside the tank until they reach the PMTs. A quick estimate can give us an idea about the importance of the foil: in absence of the reflective foil, a single photon would be collected only in 0.001% of the cases. Last September 2013, the Muon Veto group, constituted by Bologna, LNGS-Torino and Mainz colleagues, had put the first stone towards the assembly of the XENON1T experiment. The water tank, constructed from the top, was at that time only few meters high. The inner part of the roof was then easy to reach and allowed us to attach the reflective foil in few days. It was a very delicate job. In the following months the construction of other parts of XENON1T developed very fast (see previous blog entries) and after one year of intermittent work, this October 2014 the Muon Veto group travelled to the water tank and meet all together. 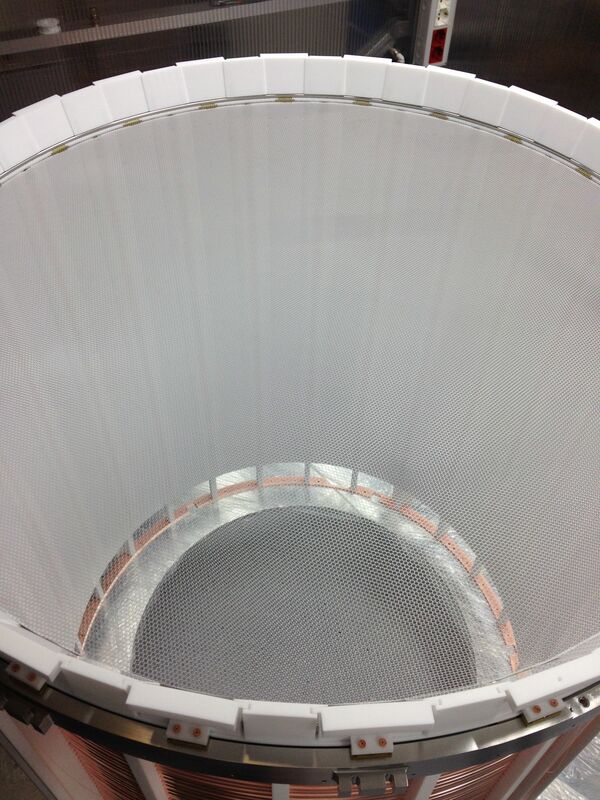 We continued carefully attaching the reflective foil, cladding the complete, huge water tank from the inside. The next important step was to mount the PMTs to the roof and wall of the water tank. In order to allow the path from the farthest PMTs to the electronic room outside the tank, one had to deal with 30m of high voltage and signal cables for each PMT. Mounting the PMT was the most sensitive step, because these detectors are very delicate and any mistake could result in permanent damage. For this reason, we used appropriate white Mickey Mouse gloves and a lot of caution. 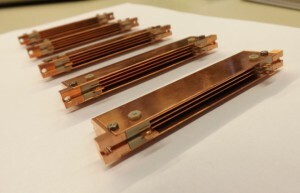 The high accuracy of these detectors can be well understood by considering that a PMT can perfectly distinguish a single photon, while the threshold for the human eyes is around hundred photons. PMTs mounted on the roof of the water tank, and still covered with their mechanical protections. Later on, the two independent PMT calibration systems were mounted. They allow us to obtain, when necessary, a response of the PMTs even when the water tank is closed. The first calibration system consists in a set of optical fibers with one end connected to a PMT and the other end to a blue LED pulser, outside the water tank. The optical fibers are able to transmit all the incoming light via total internal reflection. In fact, when you illuminate one side, light travels through the 30m of fiber and gets out entirely from the other side, looking like some peculiar Christmas lights. The second calibration system is made of four diffuser balls submerged in the water, which can illuminate all the 84 PMTs simultaneously. Thanks to a wise choice of materials, this handmade system is capable of transmitting light homogeneously in all directions. For calibration purposes, it is useful that all PMTs receive the same amount of light. The diffuser ball looks like a very uniform blue bulb when it is turned on in a dark room. PMT and relative optical fiber mounted on the wall of the water tank. Most of the reflective foil still has a protective layer on. After one month of hard work now, in November 2014, we completed the main part of the Muon Veto installation. All this work has been concluded successfully thanks to a strongly motivated team that has seen years of preparation finally getting realized. Top view of the water tank. The XENON1T cryostat is already mounted together with the cryogenic pipe. The reflective foil is still covered in a protective layer. This entry was posted in Experiment and tagged 2014, construction, experiment, Muon Veto, water tank, xenon, XENON1T on December 1, 2014 by Federica Agostini. Building a detector which uses thousands of kilograms of xenon in liquid phase poses many serious technological challenges. Details that may appear trivial at small scales become a challenge when we go towards high masses. The storage of xenon is maybe the most evident example. One option is to keep xenon in several standard gas bottles, another option is to have a very large tank to store it. Both solutions imply keeping xenon in gaseous phase. To get an idea of the dimensions of the problem, we have to think that storing about 4000 kg of xenon at standard pressure would require a volume as big as the XENON1T water tank! 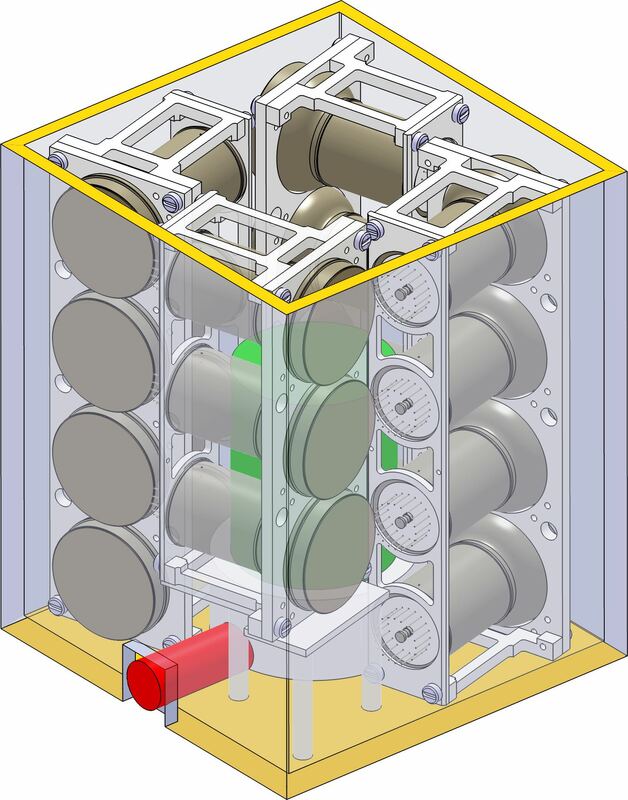 Moreover, we would like to have something more than a simple storage vessel, namely a “bottle”, with its own cooling system, capable of keeping xenon already in liquid phase. We also wanted to have liquid xenon continuously purified during its storage, so that we could have ultra pure xenon available at any time for the detector. Finally we wanted to use this storage also as an efficient recovery system: for any reason, due to a maintenance or even an emergency, we wanted to be able to transfer xenon from the detector into this storage system in few hours. Can all these requirements be met by a single smart system? Yes, and we have built such a system for XENON1T. We call it ReStoX (Recovery and Storage of Xenon) and it has been successfully installed in the LNGS Laboratory on August 13th, 2014. 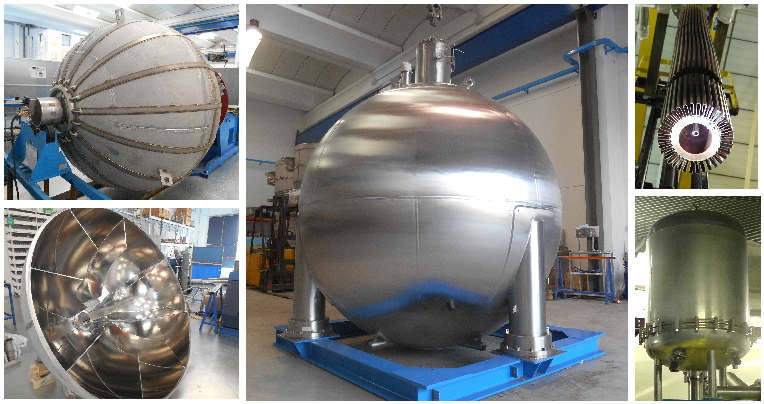 It’s a beautiful and shiny double insulated stainless steel sphere, capable of containing up to 7 tons of xenon. Seven? Yes, because ReStoX is ready to store much more than what XENON1T will require for the first science phase expected to last a couple of years starting in 2015. The system was conceived by a team of experts from Columbia University and Subatech Laboratory, and initially designed in collaboration with Air Liquide. It was patented by them in 2012. The design was later changed in many important details and much improved, thanks to the contributions of Karl Giboni and Jean-Marie Disdier. The construction was assigned to the Italian company Costruzioni Generali (CG), located near Milano, which not only built it in record time (about half a year from the design to the installation) but also improved it with technological solutions to make it the biggest and most reliable liquid xenon storage ever conceived. ReStoX exists thanks to the main contribution of Columbia University and with contributions of Subatech Laboratory and Mainz University. ReStoX has been built with two redundant and complementary cooling systems, both of them based on liquid nitrogen, so that ReStoX is able to work even in case of black-out. One is based on a circuit surrounding the inner sphere, so powerful to be even capable of freezing xenon in a short time, and another one is internal, capable of regulating the xenon pressure with high precision. And what if we run out of liquid nitrogen? No problem. ReStoX is very strong and with its 3.4 cm thick inner sphere is capable of keeping xenon safely even in gaseous phase if necessary, withstanding about 70 bar of pressure. Not bad for a “bottle”, isn’t it? This entry was posted in Experiment and tagged 2014, construction, cryogenics, experiment, Storage, xenon, XENON1T on October 17, 2014 by Luca Scotto Lavina. 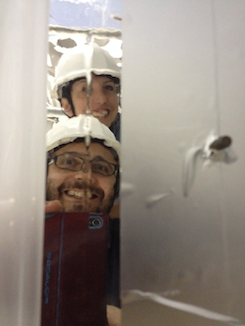 Dr. Marcello Messina (from Columbia University) and Dr. Domenico Franco (from Zürich University) underground in front of the two XENON nitrogen storage tanks. This entry was posted in Experiment and tagged construction, experiment, XENON1T on August 6, 2014 by Rafael Lang. The XENON dark matter experiment is installed underground at the Laboratory Nazionali del Gran Sasso of INFN, Italy. A 62 kg liquid xenon target is operated as a dual phase (liquid/gas) time projection chamber to search for interactions of dark matter particles. reduction of external radioactive backgrounds due to the self-shielding capability of liquid xenon. background, from nuclear recoils, which are expected from Dark Matter interactions. And of course, the more energy a particle deposits in the detector, the brighter both S1 and S2 signals are, hence allowing us to reconstruct the particle’s deposited energy as well. This entry was posted in Experiment and tagged experiment, TPC, xenon on January 23, 2014 by Rafael Lang. To contact the XENON collaboration, please send an email to contact@xenon1t.org. To request a conference presentation you may also contact our speakers office directly at speakers@xenon1t.org. The XENON experiments are made possible with support from the National Science Foundation, Department of Energy, Schweizerischer Nationalfonds, Volkswagen Foundation, Deutsche Forschungsgemeinschaft, Bundesministerium für Bildung und Forschung, Fundação para a Ciência e a Tecnologia, Region des Pays de la Loire, Max-Planck Gesellschaft, Stichting voor Fundamenteel Onderzoek der Materie, Istituto Nazionale di Fisica Nucleare, Weizmann Institute of Science, ITN Invisibles, and the EMG research center. We are grateful to the Laboratori Nazionali del Gran Sasso for hosting and supporting our experiments. Please contact us if you would like to contribute as well.